La Dolce Vita University (LDVU) is the perfect sampler for anyone curious about (or already in amore with) Italy and its remarkably rich cultural gifts, both past and present. True to its lighthearted name, La Dolce Vita "U" is all about pleasurable learning, or what we prefer to call "edu-tainment." Its dozens of entertaining yet authoritative mini-essays on a wide assortment of intriguing topics encourage random dipping at the reader's pleasure. Even the most erudite Italophile will discover fun new facts and fascinating new insights in the pages of La Dolce Vita U.
Mini-essays treat specific topics in one or more of the following subject areas: the Italian character; the visual arts (art, artists, architects); the performing arts (music, theater, cinema); history and antiquity; language and literature; cuisine and agriculture; wine and spirits; traditions and festivals; style and applied arts; unique places. In a wink and nod to the book's "academic" identity, the 165 mini-essays are arranged alphabetically and accompanied by charming illustrations throughout. A special traveler's topic index is provided at the end of the book. Carla Gambescia's passion for Italy began early--with her mother's love of the Renaissance masters and her father's discourses on Italian geniuses of every calling. In the ensuing decades she has toured every region of Italy (often by bicycle) and immersed herself in its astonishing array of cultural treasures. In recent years Carla has combined her passion as an Italophile and writer with her skills as a career marketer and branding expert, acting as a consultant to and a collaborator with boutique tour operators. She conceived and co-led the Giro del Gelato bicycle tour, winner of Outside magazine's "Best Trip in Western Europe." In 2008 Carla founded Via Vanti! Restaurant & Gelateria, in Mount Kisco, New York, with the ambition of creating a unique environment and dining experience that would enable guests to feel as though they had stepped right into Italy. Via Vanti! quickly won plaudits not just for its innovative Italian cuisine, extraordinary gelato (named "Best Gelato Shop in New York") and dazzling jewel box interior but also, under Carla's direction, for its active program of culinary and cultural events. It is Carla's conviction that all of us, regardless of our inherited ethnicities, share an "inner Italian"--that part of our nature which is most expressive, festive, spontaneous and fun--just waiting to be unlocked. 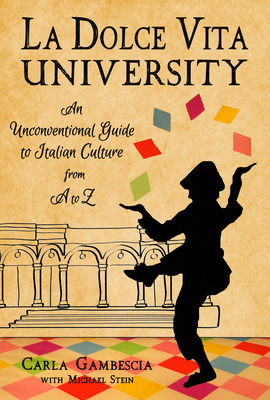 La Dolce Vita University: An Unconventional Guide to Italian Culture from A to Z is the natural outgrowth of Carla's work and play in both the restaurant and boutique travel industries, as well as a lifelong love affair with the land of her ancestors.